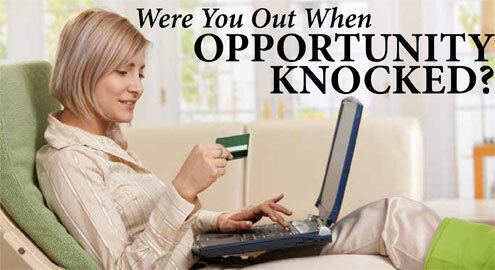 Were You Out When Opportunity Knocked? As the online retail economy continues to grow, and as more people adopt mobile technology including smart phones and tablets[i], consumers will have greater opportunities to browse online and research optical products 24/7/365. The December 2011 Vision Council Vision Watch Internet Influence Report stated that 26.7 per cent of 1,306 contact lens buyers surveyed in the U.S. used the Internet in some capacity when purchasing contact lenses; another 16.4 per cent purchased their lenses online. The two most influential forces cited by survey respondents were price and convenience[ii]. And as a result, bricks and mortar businesses lost sales revenue of about $604 million to online sources. To minimize contact lens prescription walkouts, practitioners must build on or implement marketing strategies to improve retention of existing contact lens patients. Over the years, marketers have turned contact lenses into a commodity, which is why patients seek alternative retail outlets. Patients need to understand that contact lenses are medical devices that sit on the surface of the eyes to correct their vision. Emphasize that you want their eyes to be healthy, to work well together and to have normal field of vision. Besides the cornea, they need to understand that the lids, lashes, conjunctiva and tear film all need to be assessed periodically to ensure optimum vision, comfort, eye health and continued contact lens success. Know and meet your patients’ lifestyle and visual needs. Market yourself as the go-to expert with access to a diverse product line, including specialty lenses for keratoconus, orthokeratology presbyopia and therapeutic uses that only you can customize for them. Upgrade as many existing patients as possible to newer-technology products and communicate the benefits for them to them. Competing with online providers who benefit from low overhead and high-volume purchases will get you nothing except a revenue shortfall. Be fair to yourself and to your patients. Don’t undervalue what you do but, at the same time, keep profit margins reasonable. Patients associate higher prices with higher quality products and exceptional service, but they look at the value they receive from the interaction, too. They want to buy from you; don’t give them a reason to shop elsewhere because of over-inflated prices. You should be selling annual supplies. Explain to patients the economic benefits of volume purchasing and manufacturer rebates, if available. If this doesn’t convince them, explain the health benefits of fresh lenses on the eyes when replaced in a timely manner. It is much better than extending the wear of their last pair and putting their eyes at risk for contact lens complications. Encourage patients to take an interest in their eye health and help them to realize how precious their eyes and good vision are. There is no denying it – both you and your patients spend time online for sports, games, news and information, entertainment, retail and/or social networking. During the week of Oct. 22, 2012, comScore’s survey of 1,989 U.S. respondents ranked “Retailer Websites” second, after “Online Search Engine”, as the most valuable tool for shopping[iii]. Yet, in a recent survey conducted by Breton Communications, fewer than three-quarters (74.2 per cent) of Canadian eyecare professionals reported having a website and 11.2 per cent had no Internet access in their offices[iv]. At the very least, create a business website and have a digital presence where your patients can seek you out. Be the person in front of your patients when they are on their smart phones commuting to and from work or on their tablets after dinner. If you haven’t done so, consider getting on the social media bandwagon or create a blog and start building fans and followers who are interested in your products and services. E-stores: To Have or Not? This is a contentious topic for many practitioners but the reality is that in recent years, more and more practices have incorporated secured contact lens re-ordering platforms through their websites. This has enabled them to capture revenue that would have been lost to online suppliers, while making the contact lens sales process simpler and more convenient for their patients. Your patients come to you for guidance and as a resource and will pay a premium if they perceive value in the services you provide. Your job as a practitioner/salesperson is to direct them towards a final sale with your reputable service. So make service your number one brand! [i] WALL, Mike. “2012 Canada Digital Future in Focus: Trends Every Marketer Needs to Know”, comScore Webinar presentation, March 2012. [ii] The Vision Council Research: December 2011 Vision Council VisionWatch Internet Influence Report. [iii] FULGONI, Gian, LIPSMAN, Andrew, ESSLING, Ian. “The State of the U.S. Online Retail Economy in Q3 2012”, comScore Webinar presentation, November 2012. [iv] SOMMERS, JoAnne. “Canada’s ECPs by the Numbers”, Envision: seeing beyond, November/December 2012, p. 8-18.